“Lions, and tigers, and bears! Oh, my!” Oh, wait…in Africa you won’t see bears and tigers. But you will see lions, and elephants, and hippos, and giraffes, and rhinos, and gazelles, and much more! And no one brings you Africa like Monograms! On this 8-day private safari, we've arranged your choice of accommodations, almost all of your meals, game drives, and ground transportation between destinations. Plus, Monograms has arranged for you to have private 4-wheel drive safari vehicle with a professional Driver/Guide throughout your vacation. That’s right—private, ensuring this is your safari…your way! 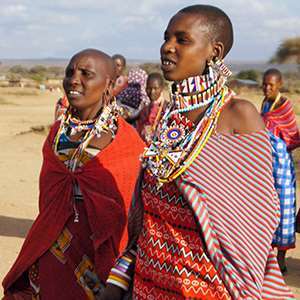 Along the way, your Driver/Guide will share insider knowledge about the wildlife and local culture in Tanzania. The safari vehicles feature a pop-up roof for easy game viewing and photography. Ngorongoro Conservation Area is home to Ngorongoro Crater, the world's largest unflooded caldera. On your full-day game drive here, you may see lion, Cape buffalo, hippo, elephant, flamingo, and maybe even the rare black rhinoceros. From Ngorongoro, we’ll transfer you to Serengeti National Park, Tanzania's largest and most famous park and home to the annual wildebeest migration. In your three game drives here, we’ll be on the lookout for the “Big 5”—lion, leopard, Cape buffalo, elephant, and rhino. Have your camera ready because there’s also an abundance of other animals, including cheetah, giraffe, gazelle, and eland. This vacation package offers you the chance to see the “Big 5”—lion, leopard, Cape buffalo, elephant, and rhino—in Serengeti National Park escorted by your Monograms driver/guide in a private safari vehicle. Travel south to TARANGIRE NATIONAL PARK, where baobab and acacia trees dominate the landscape. After lunch, embark on an exciting AFTERNOON GAME DRIVE. Today features MORNING & AFTERNOON GAME DRIVES in the savannah grasslands. Enjoy panoramic views of baobab and acacia trees as you search for the elephant, eland, zebra, and Cape buffalo that congregate around the waterholes. Relax at your lodge or camp between game drives. Drive to LAKE MANYARA NATIONAL PARK at the base of the Rift Valley escarpment. This small park is ecologically diverse, with groundwater forests, grassy plains, and alkaline Lake Manyara itself. During a GAME DRIVE, watch for elephant, Cape buffalo, and giraffe. The park is also home to the world’s largest concentration of baboon. Then, drive to beautiful Gibb’s Farm for a relaxing lunch featuring sumptuous farm-to-table cuisine. 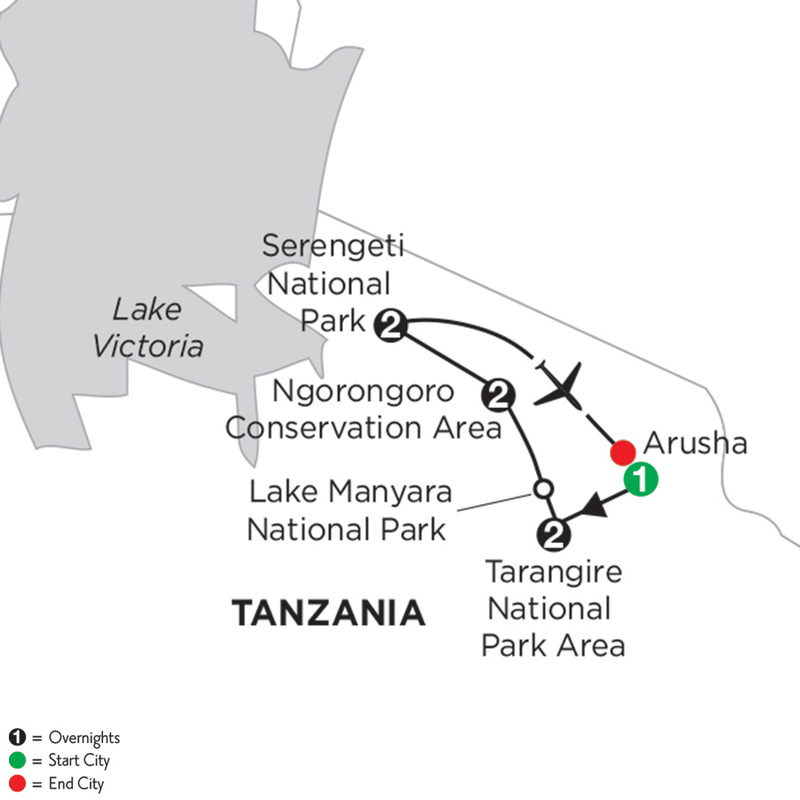 Afterward, continue to the NGORONGORO CONSERVATION AREA for the night. Today, enjoy a FULL-DAY GAME DRIVE in Ngorongoro Crater. The crater is technically the world’s largest unflooded caldera—at more than 2,000 feet deep with a floor covering over 102 square miles. Game viewing here is fantastic, as most of the animals stay in this area year round. You can see lion, Cape buffalo, hippo, elephant, and flamingo. This is also your best chance to see the rare black rhinoceros. A picnic lunch will be served in the crater. This morning, drive to SERENGETI NATIONAL PARK, Tanzania’s largest and most famous park. Home to the annual Great Migration of wildebeest and zebra, generally between late November and July, it attracts visitors from around the world and is great for game viewing year round. Enjoy lunch prior to your AFTERNOON GAME DRIVE. Today, enjoy MORNING & AFTERNOON GAME DRIVES and search for the “Big 5”—lion, leopard, Cape buffalo, elephant, and rhino—as well as an abundance of other animals. The Serengeti covers an area of roughly 5,700 square miles, so it is no surprise that the name comes from the Maasai word siringit, meaning “endless plains.” Between game drives, take advantage of leisure time to relax. This morning, fly back to Arusha, where your vacation ends. We have reserved a day room at the Mount Meru Hotel for you to use prior to your homebound flight. Book homebound flights after 5 pm. Between destinations and for all game drives: private 4-wheel- drive safari vehicle carries up to six people, and features a pop-up roof for easy game viewing/photography; private transfers to/from intra-vacation flight; intra-vacation flight and taxes are not included. Book 3 Sopa properties or 3 Serena properties and save up to $140. Contact your travel professional for details. Situated at the foothills of Mount Meru in the city of Arusha, Tanzania, the Mount Meru Hotel lies on 9 acres of lush landscape, surrounded by some of Africa's most breath-taking vistas, rich with a diverse array of wildlife, etched against the fertile slopes of this beautiful mountain. 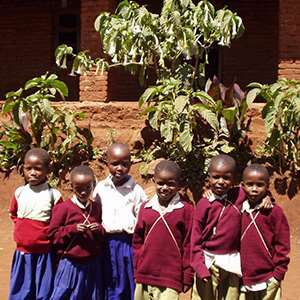 Bask in the Tanzanian warmth and kindness, renowned all over the world. Situated at the foothills of Mount Meru in the center of Arusha, the hotel sits on nine acres of lush landscape with panoramic vistas of the surrounding area. The Hotel offers the discerning traveler more than just a resting place when it comes to accommodation. The room itself is an experience of understated African opulence, open space and natural light. Take in the spectacular views from the privacy of your room as you bask in the glow of an African sunset. In the heart of Tarangire National Park surrounded by ancient baobab trees. Each spacious room has a private lounge on entering with a mini bar and 2 queen size beds with a mosquito net around them. Ceiling fans keep the rooms cool and glass sliding doors that open out on to a balcony, with a great view of the landscape beyond, and wildlife can some times be spotted. Built atop a valley in the Ngorongoro Highlands, the exclusive Tloma Lodge was crafted to evoke the ambiance of the colonial plantations and farms described in many books and films. Its flowered gardens, pool, spa treatments, al fresco dining, and spectacular views overlooking a coffee plantation make this a serene oasis. Tloma Lodge is an exclusive 36-cottage lodge situated within the Ngorongoro Highlands area. The excellent location of Tloma Lodge on the raised shoulder of a valley offers breathtaking views over a coffee plantation and onto the eastern wall of the magnificent Ngorongoro Crater. Spacious ensuite cottages feature private bathroom with shower, a private terrace with views of the Ngorongoro Highlands, fan, 24-hour electricity, and comfortable beds with mosquito nets. Nestled in the acacia woodland on the edge of the escarpment overlooking the plains of the south-western Serengeti National Park, one of the most famous parks in the world, and host to the largest and most spectacular annual migration of the wildebeest. Electricity is provided 24 hours a day. Nestled in the acacia woodlands on the edge of the escarpment overlooking the plains of the southwestern Serengeti National Park. Standard rooms are tastefully furnished with local fabrics and pictures with 2 queen size beds. On entering the room there is a lounge with a mini bar. In the front is a verandah with 2 comfortable chairs and coffee table, with glass windows facing the vast Serengeti plains which extend as far as the naked eye can see. The rooms have ensuite bathrooms and hairdryers. Arusha Coffee Lodge lies cradled in the endless acres of Tanzania's largest coffee plantation. This exclusive, boutique hotel lodge has been designed around the farms' original plantation homes, radiating the warmth and invitation of the old colonial plantation homes historically distinctive to the coffee plantations. Luxurious accommodation, fine cuisine, and roaring fires beckon to the most seasoned traveler. Situated on the western edge of Arusha town in one of Tanzania's largest coffee plantations and surrounded by endless acres of coffee bushes. The Arusha Coffee Lodge accommodation consists of 30 plantation houses lavishly furnished, featuring split-level living room area and a private deck patio. With large four poster beds with Egyptian cotton linens and a variety of guest amenities, the Arusha Coffee Lodge is the place to relax and rejuvenate before or after a Tanzanian Safari. Designed to echo the traditional style of the colonial coffee farm, which originally stood on this site, Lake Duluti Serena Lodge offers a range of tastefully presented cottage-styled rooms set amid extensive landscaped grounds. Electricity is provided 24 hours a day. Nestled amid coffee plantations at the foot of the wooded slopes of Mount Meru on the shores of tranquil Lake Duluti. Rooms are presented in the style of stone-built cottages, which are grouped in clusters around a flower-filled central 'village square'. Spacious and elegantly presented in classic country-house style, they feature marble bathrooms, double French doors leading out into the gardens, leaded windows, a stylish work or vanity area, and large and comfortable beds. In the heart of Maasai country and a remote corner of the Tarangire, in total seclusion amongst giant acacia trees and looking out beyond the flat savannah, Sanctuary Swala offers a very exclusive safari experience with just 12 canvas pavilions. The picturesque landscape is filled with ancient baobab trees, ambling elephants and birds in flight. Built to the highest eco-friendly standards, this camp has a particularly low-carbon footprint. Electricity is provided during limited hours: 6 am to 1 pm & 5 pm to 10 pm. 24-hour power may be requested for breathing machines. Sanctuary Swala is located in an exceptionally private section of the Tarangire National Park, offering visitors a luxurious and very exclusive safari experience. Each of the 12 canvas pavilions is shaded by tall acacia trees and all are within sight of the well frequented water hole. They are unashamedly luxurious and exquisitely furnished but still close enough to nature to permit an exciting night under canvas. The tents feature a spacious open plan arrangement with comfortable king or twin beds, campaign chairs and plush sofas and boasts an ensuite bathroom with both indoor and outdoor shower for that extra bit of luxury. Sip cocktails or enjoy scrumptious dinners on your own private veranda and watch the waterhole which regularly draws lions, leopards and resident bull elephants while your own personal attendant caters for your every need. Perched on the rim of the collapsed volcano, the Ngorongoro Crater, a world heritage site, often referred to as the eighth wonder of the world. It has the most magnificent views over the crater floor, which is home to vast herds of buffalo, wildebeest, zebra, the rare and endangered black rhino, elephant, cheetah, leopard, lion and herds of gazelle and wildebeest. Its position on the Eastern rim allows the most spectacular and uninterrupted views of the sunset. Electricity is provided 24 hours a day. On the eastern rim of Ngorongoro Crater. All of the spacious rooms feature queen sized beds and a separate dressing area. Each room has a glass fronted verandah, where you may enjoy a private view of the Crater. Regularly voted one of the best hotels in the world, this unique lodge clings to the rim of the magnificent Ngorongoro Crater, the largest and most perfect volcanic crater on Earth. Long and low, the lodge is built from local river stone and camouflaged with indigenous vines. Designed to blend completely into the landscape, it is entirely invisible from the floor of the Crater 600 meters below. Hugging the contours of the jagged Crater rim, the lodge takes its inspiration from the so-called 'Cradle of Mankind', the prehistoric site of Olduvai Gorge, which lies close by. Linked by arched stone passages and timbered decks, its walls are decorated with stylized prehistoric cave paintings and lit by flaring torches. Electricity is provided 24 hours a day. On the southwestern rim of Ngorongoro Crater. Strung around the Crater rim, each with its own rock-enclosed balcony, the rooms feature brass lamps, embossed leather headboards, wildwood mirrors, Maasai carvings and stylized prehistoric cave paintings. Each room enjoys uninterrupted views over the Crater's unmatched splendor. Centrally located adjacent to the famous Western Corridor and Grumeti River, the lodge has been designed to blend completely into the living landscape. A series of traditional domed 'rondavels' are widely spaced throughout the grounds, which are cooled by groves of acacia trees and watered by sparkling streams. On the very edge of the ridge is a 'vanishing horizon' pool, which looks out over the 'endless plains' after which the Serengeti is named. Electricity is provided 24 hours a day. Set on a ridge in Serengeti National Park with panoramic views of the vast Serengeti plains. Each charmingly presented room is accommodated in a two-story (one up, one down) stone-built, traditionally-thatched 'Rondavel'. Looking out over the plains, each has its own private balcony, private entrance, spacious bedroom, natural stone bathroom and intricately carved furniture. Hidden among the rocky outcrops Serengeti Migration Camp boasts 20 spacious luxury tents with rich furnishings. The camp blends seamlessly into the environment and features a split- level lounge, a swimming pool, restaurant, and viewing platforms with views across the Grumeti River and the rugged landscape beyond. But it is the drama and proximity of the wild, which takes the experience of this camp to a higher level. Electricity is provided 24 hours a day. The camp is located along the Grumeti River in the north of Serengeti National Park. Each of the 20 tents were built with comfort in mind and feature an ensuite bathroom with shower, twin wash basins, luxurious soft furnishings, a writing desk, and fan. Wooden floors, fixed bathroom walls, and fixed wooden doors combine with the canvas to create a private sanctuary. This extends outdoors to the 360-degree verandah which allows you to enjoy the constant game sightings and the sounds of the bush. Visit a local primary school and learn more about the Iraqw culture and way of life.